PHOTOGRAPHER: The brief was to create the annual Australia day photo series for the Sunday age. The theme this year was the Australian Backyard. I had to make six pictures for inside the paper and one for the front cover. The photo montage for the front page was of a family playing cricket. They have was a big backyard in the suburbs, it has its own cricket pitch, a trampoline, lots of space. I photographed it all in parts, the kid on the trampoline, the grandfather cheering him on, family playing cricket in the background, the father was the umpire with a can of VB beer, the neighbours were sitting on their sun-chairs watching, There’s a portrait of a little girl and people sitting watching on the fence. There was no way of getting all those elements in one picture, so I photographed it in about ten parts. No-one could quite understand what I was doing at the time of photographing them. But that’s ok. I was making them up in my head as I went along. Not even I understood half the time. Later on I put the parts together. Then I continued that theme for the rest of the work. PHOTOGRILL: Tell us about the photo montage of the farmer? PHOTOGRAPHER: I was lucky enough that the subject had sent some low-res images of his backyard to the reporter Peter Munro. I was able to see some of the space, there were trees and a beautiful green area surrounded by red dirt. But the background was a bit messy with a clothes line in the middle. I decided then to place the farmer against a blue bed-sheet hanging from the clothes line. The photo would feature colours, blue sky, blue bed-sheet, green grass, and red dirt. The farm is 300km West of Melbourne, in Horsham. It was the third photo shoot of the day. At some point in the day I’d have to go and buy a blue bed-sheet. The problem was that between and Melbourne and Horsham there were floods. Roads were cut off, I had to make diversions and I got stuck, only arriving in Horsham at 5PM as the shops were closing. I went tearing through the town and managed to find a K-Mart that was closing. I ran in without even parking the car, asking the security guard where the sheets were as I ran past. Luckily, there was one double sheet that was sky blue, the rest were multi-coloured prints. The whole day could have been wrecked right there. PHOTOGRILL: How did you make the individual photos? PHOTOGRAPHER: The main photo in each montage is lit with Elinchrom battery powered studio lights and a softbox. So the main subject is nice and crisp. It also helps keep the same aesthetic throughout all the pictures. When I imagine the aesthetic for a photo series it’s starts with an idea, but it moves on to the gear and the techniques, they all have to be the same through-out the photo series. The cameras and lenses have to be the same, ASA the same, lighting etc. I chose the equipment and techniques because I knew what feeling they’d convey. The whole project was done on a feeling. I didn’t know how I was going to put the photos together while I was photographing the subjects, but I knew what the feeling of it would be. 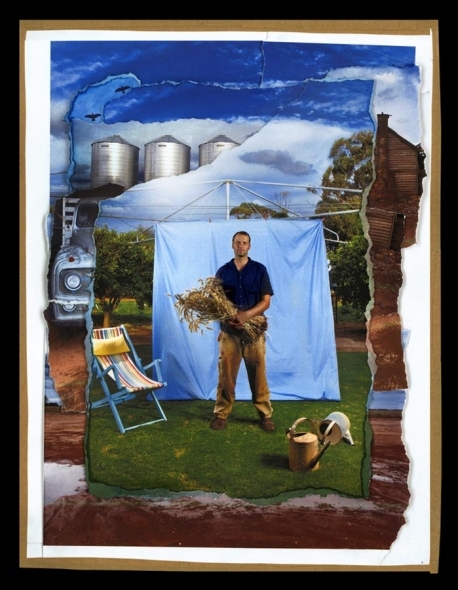 After I photographed the main subject using lighting I then went around his property and I photographed about forty different elements, the red dirt, the falling down shed, the birds flying over-head, the wheat silo, the old truck. All up the shoot probably took about two hours. It was on sunset, I was really lucky, light-wise. PHOTOGRILL: What about printing and positioning the photos? PHOTOGRAPHER: Back in the office I started by printing the main portrait. Everything else would get built around that. The hard thing about it is guessing how big the elements needed to be printed, there’s no science on this. I went through six boxes of 50 sheets of photographic paper. It was a lot of printing, which had to done at night because we have networked printers. I was using expensive photographic paper and I didn’t want people to print emails on it. So I was printing from about 11pm till about 2am each night. Since I had to guess what size each element needed to be it was a long process. A centimetre too big and I had to come back and print it again the next night. Each montage was an image in my head at this stage. But at the printing stage I had a hundred of individual photos that I had to make into one. Choosing and sizing those photos was guess work at first. I tore the edges of each photo, and if I did the tear wrong I had to print it again. By the forth photo montage it was down to a science. The wastage was smaller and I was working faster. I began to see how the photos would fit in before I printed them. The goal was make each element fit into the montage so that it ‘talked’ with the montage, without yelling or being drowned out. Once I knew how each piece in the puzzle would fit in, it was stuck down on a backing board. Then I hand painted all the white edges of the tears so the photos would blend in together. The borders were made by hand using art tape. PHOTOGRILL: Did you discover a secret to sizing and positioning the photos? PHOTOGRAPHER: There’s no easy answer, they’re very complex images. So the goal is to put them together in a way that simplifies them. The viewer needs to recognise instantly what they’re seeing and understand the message. The balance of the elements is critical. My job was to take what’s complex and make it simple. The more I simplify, the longer people look at my images. If they can’t grasp what the image is then I’ve failed. PHOTOGRILL: How did you digitise them? PHOTOGRAPHER: Each montage is A4 size to fit inside a flat bed scanner. The Age newspaper’s imaging department made the scans at about 100mb each. There was a problem scanning. There was a dot-gain pattern caused by interference between the dots in the prints and the pixels at the scanner. The imaging depart figured that out. It was was nerve racking for me since I’d already made all of the artwork. Once the scans were done they went back into Adobe Photoshop for final adjustments, and to make sure all the images worked as a group. From shooting to final production, each image took around 20 hours, excluding travel. Because the deadline was Australia Day I had to work flat-out, I didn’t sleep for two weeks, pretty much. This entry was posted on Sunday, April 3rd, 2011 at 3:55 pm. 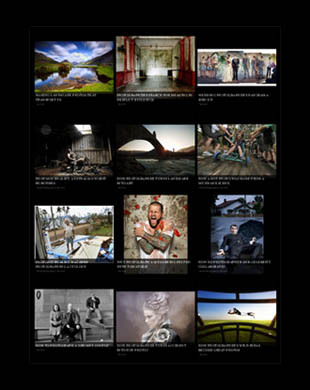 It is filed under Fairfax Photographers, The Grill and tagged with Creative Photography, Lighting, People, Photographic Techniques, Photojournalism, Portraiture. You can follow any responses to this entry through the RSS 2.0 feed. Clapping hands and whistling …..Excellent!! Top stuff Simon, Love it!